Dudes and Dudettes, welcome to the first ever Gooroll Showdown, the only game where Goos roll for big money! Tonight’s matchup features our returning champs, The Milwaukee Brewers. They take on arch-rivals, The Chicago Cubs, in what will prove to be a close matchup! -At Third Base, he doesn’t know whether to keep his sunglasses on or stylishly rest them on his forehead. But one thing he does know is that his hat should always be backwards! He’s Goateed Bucktoothed Little League Umpire Guy! -Playing catcher, he knows his mustache is not complete without a bratwurst to insert into it. But he spends his days wondering where the Brat Vendor is located. Oh wait, there he is! He’s “Two Bratwursts, Please” Guy! -At first base, this guy can give you a really good deal on some crank. He’s The Camo New Era Hat Wearing Crystal Meth Dealer Guy! -And at right field is the winner of the 1998 Guz Award For Sportsmanlike Conduct In The Field Of Sport. He doesn’t normally watch baseball and he doesn’t know where to look. What he does know is that the sun’s rays can kill, so he never leaves home without his bucket hat and shades. He’s The “I Didn’t Know The Retractable Roof Was Going To Be Up” Guy! -And introducing the Brewer’s Ace pitcher, The Token Girl In The Frame That Actually Knows What’s Going On! And now, please give a warm welcome to our guests, The Chicago Cubs! -In left field, is that a pretzel in her mouth or a hot dog? Is that a Pom-Pom in her hair or is she wearing a plastic wig? Regardless, we know her name is Insecure Girl From The 90’s That Goes To Baseball Games Arbitrarily Rooting For The Away Team In Order To Unsuccessfully Pick Up Guys! -And as always, in centerfield, we have Bored And Insecure Sidekick Girl! -In right field is the 20 year veteran, “Why Do I Always Take My Granddaughters To Baseball Games?” Guy! -In his first start at first base, introducing The Guy That Is Either Drunk Or Mentally Handicapped But Is Having A Great Time Regardless! -At third base is Guy That May Or May Not Be Steven Spielberg, Whose Face Is Covered By A Guy That May Or May Not Be Fred Durst! 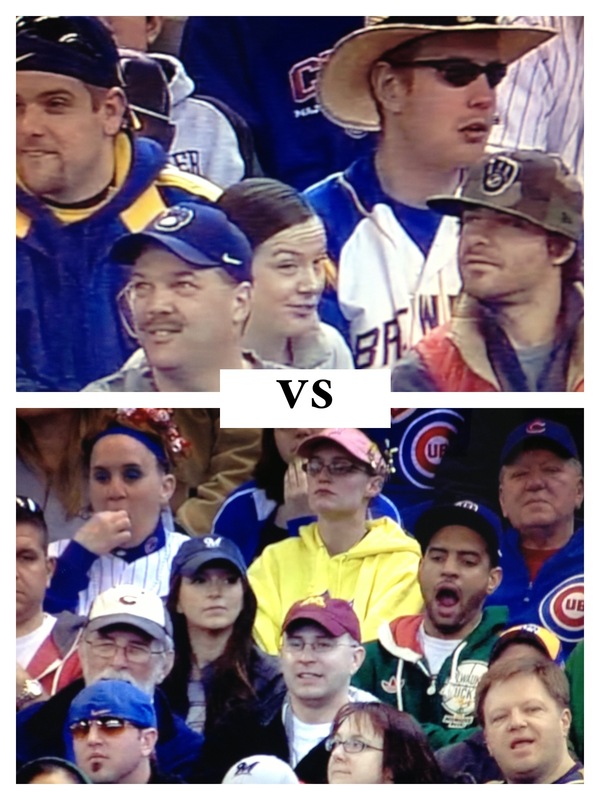 -Pitching for the Cubs will be Yawning Basketball Fan Guy! And without any further interruption, Let’s Play Ball!!!!!! Wait, we didn’t make up any rules. Oy, dis hea eys a match o roundas, ye?